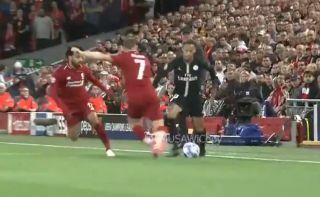 James Milner’s crunching tackle on Neymar is one thing, but watch closely for the brilliant little reaction of Liverpool manager Jurgen Klopp in the background. If you watch carefully in the video clip below, you can see how much the German tactician enjoyed the challenge from his star midfielder with a subtle little fist pump just as it happened. Neymar didn’t know what had hit him at Anfield as he had an anonymous game in PSG’s 3-2 defeat. In this era of superstars moving for transfer fees worth hundreds of millions, there’s something refreshing in seeing a 32-year-old signed as a free agent running the show for Liverpool on this big stage.